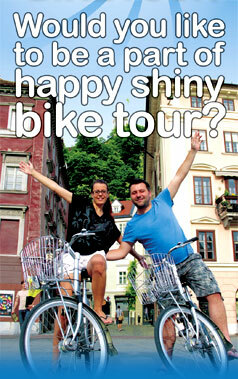 On our sightseeing tour through Ljubljana we will feel and see sun, water, air and freedom. Besides that we will see many attractions in the city center and surroundings. - picture of the tour. When? Shared tours (participants who booked the tour agreed to share the tour with other travelers) are organized at 11:00 am, from beginning of May till beginning of October. Other private tours we can organize for You every day and anytime during the daylight. Where? Meeting point on Dragon Bridge in the city center. Tour is available only for people older than 18 years. Every participant rides the bike on his own risk! In Slovenia helmets for cyclist are not obligated so we do not provide them (if You prefer to have helmets there is an option to rent them in bike shop). Participant, who joins the tour has to agree with our General Conditions. Because we would like to organize the tour on high level please fulfill application at least 7 days before the tour (especially during the main tourist season) or contact us for last minute bookings.